Jess Writes Here: Welcome to the 2nd Trimester! Sleep: can't get comfortable and I've started to not be able to sleep on back or stomach which is a bummer, plus it's 80 million degrees in our house since our a/c hasn't been installed yet! Best moment this week: revealing the big news on Facebook! Everyone has been so nice and encouraging, we feel so loved! Food cravings: hot dogs! and finally fed that craving with a footlong chili cheese dog at the Cook Out, soooo good! Anything making you queasy or sick: only when I'm hungry--I've been ravenous! Symptoms: peeing all the time! It's gotten worse--4 times in one night, that's a record! hungry all the time, and round ligament pain--I can literally feel my organs moving and uterus expanding for this babe! Looking forward to: Stef and Zak visiting next week!! 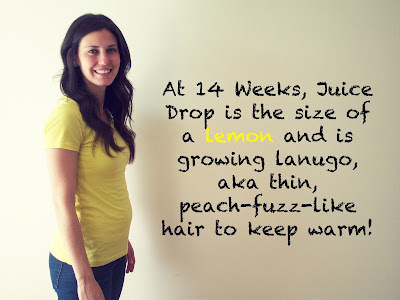 This dress looks super easy, super cute, and super maternity friendly! You can see how Meg from her wonderful blog Tripping Over Joy made the dress here. 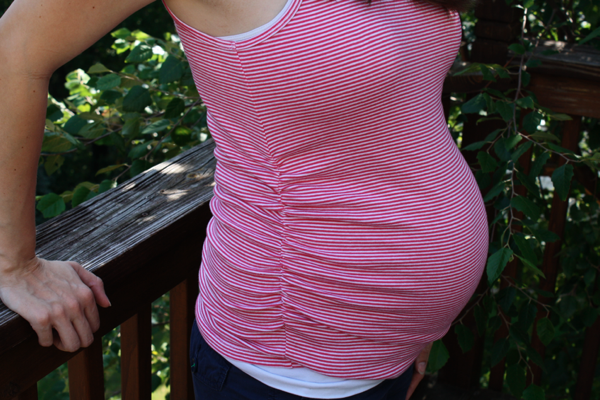 I also really love how Melissa from Sew Like My Mom made her own maternity clothes. Her blog is awesome, she has so many great ideas. You can find this wonderful tutorial here. I'll be sure to post pics when I get these projects done--hopefully soon!